Hello, there night owl, fellow adventurer of the dark. Perhaps you’ve been told before that exercise after the sun goes down isn’t such a good idea? Well, we’re here to dispel that myth, help you keep your exercise routine on track, and help you discover how and where to run at night safely. Although, as the theory goes, we are supposed to sleep at night and be active during the daytime, many people find this isn’t the case for them. Sometimes it can be quite the opposite. Meet the morning larks and night owls divide––separating those who are active in the morning, and those who find their optimal time is the night. Of course, real life isn’t so straightforward, and each individual will discover their own “peak-period” during the course of a day. However, depending on how you circadian rhythms have programmed you, you may experience more awakeness in the evening than during the day––and what better use for it than to spend some of that energy on a night time run. 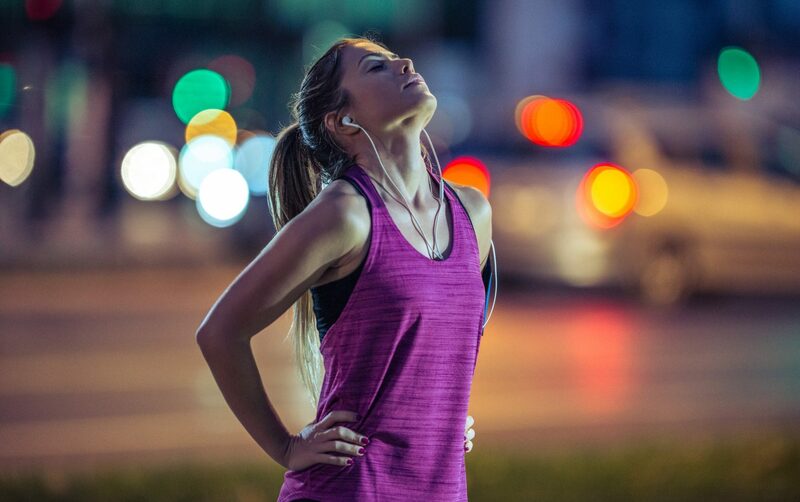 For those who like to engage in a spot of night time running, they may have heard the criticisms that ramping your body up during the hours after dark will leave you tossing and turning, but is it the truth? Let’s find out. If you enjoy a late-night run from time to time, you might have heard a lot of nay-sayers talking about the risks, but what are they? Even if you’re running on a well-lit street, running at night comes with the added danger of taking a misstep, leaving you at risk of injury, or at the very least stepping in something you really don’t want to. One of the most common dangers of nighttime running comes, unfortunately, from our fellow humans. While we don’t want to scare you too much, sometimes dark things are truly hiding in the shadows, so ensure you put your safety first. Now, that we’ve got the minuses out of the way, let’s look on the brighter side of life with the plusses of running after dark. Getting up at the crack of dawn for that morning jog before work can be a challenge, especially if you’re a natural night owl. One of the primary plusses of a nighttime run is that it allows you to fit your exercise routine in around a more realistic schedule. Plus, your body may benefit from that extra hour in bed. When you run in the morning, it takes some time for your body––muscles, lungs, etc.––to wake up after what we hope was a peaceful night’s rest. Night runners don’t experience the same issues. Although a pre-run warm-up is a necessity, by the evening time, your muscle flexibility and lung functionality are already at their peak capacity, and ready for you to workout. Despite what you may have heard––that nighttime running keeps you awake longer––this is incorrect. Aside from physical tiredness after your run, your body’s stress hormones––cortisol and thyrotropin––alongside your blood sugar (glucose) levels will be lower, allowing you to fall asleep faster and enjoy a higher quality rest. Already convinced that night jogs are for you? Then it’s time to take account of your safety. While there are many benefits to hitting the streets after dark, there are some risks too, so remember to always take care of yourself first and foremost. These are our top five tips for keeping you safe on your night run. Whether you’re running on a well-lit street, a darker part of the city, or in your local village, add some a reflector to your clothing to make sure you are visible to drivers. This could be crucial as it allows them to see you before it's too late. You may also consider swapping that classic black outfit for something a little lighter to be doubly-safe. No matter where you are in the world, from Siberia to the Bahamas, the temperature will always be lower at night. So, make sure you put on an appropriate amount of clothes to keep your body warm without causing you to sweat too much. Find the right balance for your climate and your body. We know how nice it is to disconnect from the world and just listen to some inspiring music, but when you run at night this could prove fatal. Wearing headphones or earphones means you are paying less attention to the world around you, putting you more at risk of being attacked or being hit by a car. Put your safety first and choose to remove those headphones, or at least only leave one earbud in so you can still hear what's going on. We said it earlier in the article, one of the downsides of nighttime running is that the streets, pathways, park paths, etc. are all a little more dangerous at night; of course, this will vary depending on where you live. In any case, put your safety first––plan your route carefully, avoiding any dimly-lit areas, and let someone know where you’re going and an approximate time to expect you back (of course, so they can have your post-workout snack ready and waiting). Just because it’s the end of the day doesn’t mean your body doesn’t need to repair itself after your workout. That full eight hours will help, but you also aid your body by consuming a light snack before you hit the hay, such as some nuts, fruits, or even a tasty hot chocolate.